One Month at Swamiji’s Ashram…Relearning to Live! It had been three years ago since I had first visited the Ashram and now, this time, as I entered the gates, it was with a reflective nostalgia. I took my time to look all around me, wanting to take full advantage of my return here. In the Bhagavad Gita Lord Krishna tells us that, of all the months, he is Margali. Margali is a Tamil month that begins in mid-December and ends in mid-January. It is also said that to the Devas – divine beings – one of our years is for them one day, and our month of Margali is the brahma muhurtamof their day. 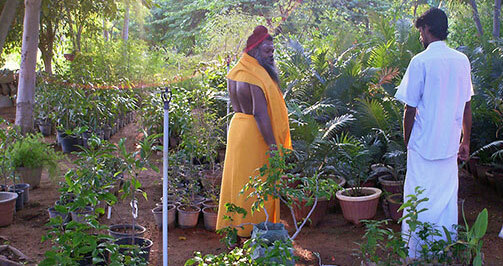 Categories: Ashram, Religious festivals, Swami Premananda. Since Swamiji’s Samadhi on 21st February 2011, the night of Mahashivaratri has continued to be one on which Swamiji’s divine presence has been so strongly felt by all his devotees and especially in Sri Premananda Ashram. Each year, just as Swamiji manifested lingams on Mahashivaratri night during Lingodbhava when he was still in his physical body, a lingam has manifested at the foot of Sri Premeshvarar lingam or at the feet of the statue of Swamiji that resides in Sri Premeshvarar temple. Swami Premananda had a deep love and respect for trees and Mother Nature and he regarded all trees and plants as sentient beings. During his lifetime, Swamiji planted thousands of trees, fruit trees and flowering plants all over the Ashram land and encouraged everyone to join this seva.